We've combined our heavy duty DUSKY hull with the conventional cuddy cabin which offers lots of protection from the weather and the sun. The Dusky 252CSS combines the benefits of a forward cuddy cabin boat with side steering controls for maximized useable deck space. Dusky 252 CSS is equipped with the Dusky Drive; a unique fiberglass outboard bracket with integrated swim/dive platform. The Dusky Drive improves maneuverability and stability to your boat while allowing a full transom for safety. Outfit her to your liking with a wide variety of equipment from our extensive options list. Dusky 252 CSS is the class leader for those who require space and pace. And custom made doesn't mean you'll spend a fortune either. Our FACTORY DIRECT means more purchasing power for you. Dusky's 278 Fisherman's Cuddy was created for the fisherman who requires 360 degrees of open cockpit fishability but also needs a shelter cabin for the family. We've raised our casting platform just high enough to be multipurpose. 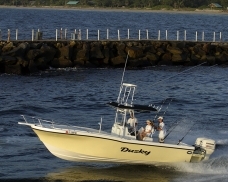 Her non-skid casting platform is still mountable for bait casting and provides lockable stowage for those anglers who leave their boat in the water or at a marina.Dusky 278 FC is equipped with the Dusky Drive; a unique fiberglass outboard bracket with integrated swim/dive platform. The Dusky Drive improves maneuverability and stability to your boat while allowing a full transom for safety. Outfit her to your liking with a wide variety of equipment from our extensive options list. Designed for the serious offshore fisherman who wants to enjoy the confidence afforded by this sturdy, heavy-duty and dependable DUSKY hull. And custom made doesn't mean you'll spend a fortune either. Our FACTORY DIRECT means more purchasing power for you. 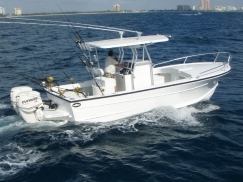 This 278 fish-around cabin boat is unique in that its walkway is wide enough to maneuver around the boat with ease. Even anglers with size 12 shoes can turn around easily in the walkway space, making a 360 degree fight with a trophy fish a snap. Dusky 278 FAC is so smooth riding that bow-seated passengers ride high and dry in comfort. Dusky 278 FAC is equipped with the Dusky Drive; a unique fiberglass outboard bracket with integrated swim/dive platform. The Dusky Drive improves maneuverability and stability to your boat while allowing a full transom for safety. Outfit her to your liking with a wide variety of equipment from our extensive options list. Designed for the serious offshore fisherman who wants to enjoy the confidence afforded by this sturdy, heavy-duty and dependable DUSKY hull. And custom made doesn't mean you'll spend a fortune either. Our FACTORY DIRECT means more purchasing power for you. We've combined our heavy duty DUSKY hull with the conventional cuddy cabin which offers lots of protection from the weather and the sun. The Dusky 278CSS combines the benefits of a forward cuddy cabin boat with side steering controls for maximized useable deck space. Dusky 278 CSS is equipped with the Dusky Drive; a unique fiberglass outboard bracket with integrated swim/dive platform. The Dusky Drive improves maneuverability and stability to your boat while allowing a full transom for safety. Outfit her to your liking with a wide variety of equipment from our extensive options list. Designed for the serious offshore fisherman who wants to enjoy the confidence afforded by this sturdy DUSKY hull. And custom made doesn't mean you'll spend a fortune either. Our FACTORY DIRECT means more purchasing power for you.